A partnership agreem ent is a relationship between individuals or organizations. Whether you have a small business or large entity it is important to understand how to structure your business. Parties involved should be in close cooperation and share responsibilities. A partnership agreement isn’t necessarily a legal contractual relationship but a relationship where you come in union to accomplish common goals and purposes that will benefit both parties. A partnership agreement is basically one where you both try striving to meet success. These partnerships could include federal/state/local government, educational institutions, trade associations, or other organizations. 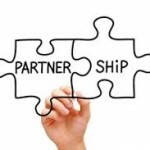 A partnership is defined as a “working relationship” which means mutual participation and joint interest. Partnership agreements are a good way to achieve goals that would otherwise be to far out of your reach. When people and/or organizations come together you can share responsibility and therefore focus harder on things you feel need the most attention. Partnerships can be effective ways to re-stabilize unorganized businesses, expand, go global, go national, increase customer base, increase sales through referrals, provide even more services your customers may desire, and much more. Often times partnerships are used when resources are limited, partnerships are a way of maximizing your resources to achieve goals and strengthen existing relationships through consumer protection, etc. Also, companies in need of skilled, talented workers will often times partner with a company/organization that has the talented, skilled, experienced employees you need to train workers and keep your business on the right track. The requirements to file and sign a partnership agreement form usually are: – You both must be at least 18 years old. – Both partners must be present when filing the partnership agreement – A legal picture I.D. card is required from each partner. – If you had a previous partnership you must file a notice for ending the partnership with the County Clerk or Notary Public before you can file a new partnership agreement. – Usually there’s a filing fee $10-$50 often times and they usually accept all forms of payment. Forum Business Advisors are specialists in helping small businesses with targeted plans of action to move your business forward. Our business consulting services have a beginning and an end. We work diligently and effectively to achieve fast results for your success.